Michele Walsh is Vice President of Development at UNICEF USA. Michele Walsh is responsible for driving aligned fundraising strategy within the critical areas of: Foundations Partnerships, Global Cause Partnerships, Corporate Partnerships, Major Gifts, Planned Giving and Regional Fundraising. 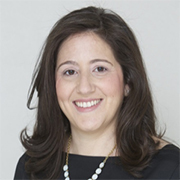 Since joining UNICEF USA in 2008, she has served in several other roles including Regional Managing Director for the New York Region where she worked with the New York Board to grow UNICEF USA’s presence in New York, New Jersey, Connecticut and Pennsylvania. Michele also served as Director of Leadership Gifts, where she led a team charged with building and stewarding relationships to provide meaningful experiences for philanthropists across the country. In over a decade with UNICEF USA, some of the most powerful moments have been traveling with Board Members and partners to experience UNICEF’s work first hand in places like the Za’atari Refugee Camp in Jordan and the Sudanese border in Ethiopia. Michele has over 20 years of experience in the nonprofit sector. She is committed to serving vulnerable populations and has demonstrated that through professional roles in fundraising and program delivery at various organizations including the Urban Justice Center, Big Brothers Big Sisters, Seamen’s Society for Children and Families. Michele earned a Bachelor of Science in Civil Engineering and Urban Planning from Washington University in St. Louis. Michele resides in Brooklyn with her husband and three daughters.